Kale; a teeneger who is traumatised emotionally after the death of his father in a car accident. He’s been sentenced to house arrest after unleashing a violent act upon his own teacher. Due to the boredom associated with the sentence, he shifts his attention on his neighborhood. He suspects that one of his neighbours is a serial killer ?!?! 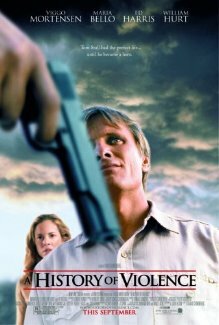 As I love mystery/thriller stories, I checked this movie while I was on my plane to Kuwait. I had the time of the world and I couldn’t sleep due to the presence of my companion ‘Amir’.. I decided to wear my headphones and watch it. The story is nothing original, a rebellious kid trys to be a detective. Too many easy opportunities to check on the neighbour( Suspect) and we get the usual response from the adults: ‘He’s just a kid who wants attention’… Very typical!!! As a result, we have to indure predictable scenes so that Kale find the evidence to his suspicion. The movie is not memorable, although I had enjoyed myself watching it. It’s doesn’t hold a ‘Buy’ tag on it. It’s a ‘Rent’ movie to be watched with your freinds on a Wednesday night. Acting wise is average although I found the ‘Suspected Neighbour’ creepy; very creepy, that I wouldn’t want to have a neighbour like him living next door to me. 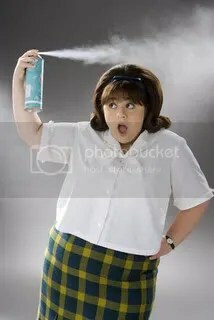 ‘ A Musical film, adapted form the winning Broadway musical ‘HairSpray’ which is originally adapted from the comdey movie: Hairspary . I didn’t expect a great movie. The fact that Travolta’s character is a woman didn’t help as well. I admit… I was mistakenly wrong.. The movie dealt with a number of issues; Teenagers boredom and TV’s influence on their lives and accordingly, their future. Racial segregation was touched also, as black kids were not allowed to participate in ‘white’music shows on TV. The highlight of this movie is the newcomer Nikki Blonsky who was given the heroine role (Tracy Turnblad); a normal teenager whose passion is to dance on her local-dance- TV show. She is talented with above average dancing skills that never fail to surprise her peers. Nikki stole the show with her role. She wasn’t acting, she’s was Tracy. This role will open so many doors to her which is refreshing as I’m fed up with those skinny untalented so called ‘Starlets’. Hairspray isn’t a newcomer advneture, A-Listers were there and with there combined experince, the film possessed an unbeatable formula. With so many characters, the director ‘Adam Shankman‘ managed to give satisfactory screen time to each of his actors without saturating us with usless scenes. John Travolta on the other hand didn’t impress me at all. He declined Richard Gere’s role in the classic musical Chicago, and he wasn’t happy when he missed a golden ticket to be in a successful movie after so many dissapointing movies. To clarify the issue, He’s no match to Gere’s; Physically and emotinly…he didn’t attempt any of the dancing routines which Gere amzingly made them his own. Chicago which made waves when it was released more than 5 years ago opened the door to musical adaptations. It’s very early to pass a judgement on this new trend, as we don’t have enough musical movies to comment on. In hairspay, the soundtrack/songs were magically captivating. Loved them all, but on the other hand, the choreography wasn’t as impressive as I thought. – Motormouth Maybelle: [watching Edna walk in] If we get any more white people in here, this is gonna be a suburb. – Edna Turnblad: Imagine! My little girl… regular, at last. – Edna Turnblad: [singing] You can’t stop my happiness, ‘cuz I like the way I am. And you just can’t stop my knife and fork when I see a Christmas ham! And if you don’t like the way I look, then I just don’t give a damn! My Verdict: 7.5/10 …. Recommended .. A ‘feel good movie’ that didn’t fail to deliver. After watching the first installment, I decided to be a faithful fan and watch the sequel when it was released. I need to make it clear that I’m a horror fan, but I will try not be biased. 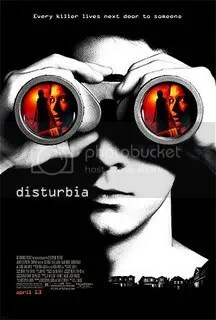 I love the genre due to it’s creepy story-lines, so I try to watch any horror movie when it is released. 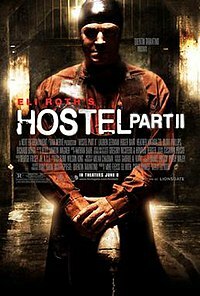 Hostel 2 starts with the main protagonist of Hostel 1 who survived the killing, hiding in a country home scarred of being caught and killed by the same people who caused him misery and killed his friends. There is no link between Part 1 and part 2 so don’t worry if you haven’t watched the first. Anyway, back to the story, 3 American girls ‘ Beth, Lorna, and Whitney‘ are on a school holiday in Rome. On a field trip, they meet the model ‘Axelle‘, who tells them about an amazing spa in Slovakia. The girls stay at the same hostel where the first movie took place. Their details are copied and posted online…. They were auctioned !!! Inside a deserted factory, lots of people (Mostly tourists) are imprisoned until the hightest bidder/winner of the auction, arrives to Slovakia and claims his /her item. Just to add few slices of pineapples, not only do men bid on this auction, women participate as well. Blame the feminists!!! Inside a chamber, they are tortured and killed. There is no law , it’s a jungle and nobody is safe; not the bidder and obviously not the prisoners/auction items themselves. If the bidder decide to back out, he would be killed and if he didn’t finish off his prey , he will be killed as well. 2) You need to kill someone, if you can’t do it , don’t bid. Otherwise, you are in a big Problem!!! I believe the reasons behind those 2 rules is that you signed a contract by having the tattoo and secondly you are not going to implicate your self if you decide to report the factory crimes because you have already participated in a crime. The movie may seem a horror movie, but it is deeper than that. I thought a lot about the ending which I’m not to disclose here. The fact that people can turn to beasts, animals and sometimes monstors in certain situations is very scarry. You can be provoked by a number of stimulators in you life and you do things that you regret it afterward. But, can you be stimulated by some events that lead you to do somethings that you can not regret because it can be a matter of of life and death?? Can you kill someone to save yourself? will you do it? So many questions that I don’t know how I’m going to answer them because I simply Don’t know !!! A lot of people found the movie to be better than the first and I’m one of them. For example, you don’t sympathise with the boys in the first movie, they went to Slovakia because they wanted to party and have, you can’t relate to them. It’s different with the girls; you feel sorry for them, you want to help them but you can’t which makes the feeling worse. After the movie , i was thinkning deeply what will I do, if I was in their shoes? How far can you go to avenge yourself? Would you kill somebody so that you can feed the fire inside you? How about hatered? The motto of the movie is ” In each one of us, there is a beast” and I do believe that when the time/ settings become appropriate, we might turn into vicious creatures, we can be murderers if we were pushed to the limit, and that what terrifies me. – Can a movie like this affect tourism? and will you reconsider visiting a contry after watching a gore movie like this? – How will you avenge yourself if you were kidnapped and tortured like the actersses in this movie? and How far can you go in the pursuance of your own vengeance? – Lorna: Would you like a smint? – Axelle: As my father always says, “nozdrovja”, to your health! 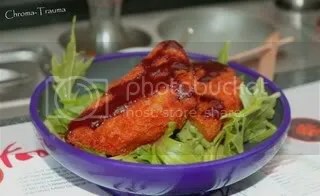 For over a week, I wanted to go this restaurant/diner with a friend of mine and because of our different timetables, it was hard to find the most suitable time so that we can meet up and have a nice light lunch. Well, we managed to do it yesterday. Let’s start with the location: It is located in the basement floor of Selfridges’s store in Manchester City Centre. Obviously, the location is not hard to miss, it’s in the City Centre, In one of the most respected stores in the UK, and is next to the Manchester Wheel; one landmark that you need to visit when you are in Manchester. Easy to find and very accessible: Checked. One thing that I found problematic (When I asks friends to join me) is the fact that is located in Selfridges’s so it is assumed (Most of the time) that you need to a budget to be able to dine there. No, you don’t. Yes it’s located in an expensive store but being located in it doesn’t influence the prices that this restaurant/diner offers. What makes this place a nice place to get together and eat is the nice funky atmosphere. They system works as the follows; every plate has a price, no matter what’s on it. Actually every colour has a price. The cheapest plate start with 1.5£ (0.750 Fills) ascending to 5£ (2.5 KD). The Green plates are the cheapest whereas the grey is the most expensive colour (Which make it a No-No option). Notice the number of plates being used and check how many grey plates are present? Not that many, obviously due to their price tag. 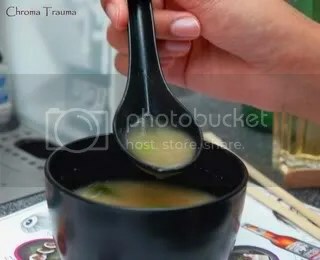 Moving to the service; as you noticed, its self serviced most of the time as you pick the food from the food slider in front of you, unless you want a cold drink or a hot soup. The staff were so friendly and very nice with us, and we were entertained by observing the chefs’ preparing the dishes. I took a number of pictures and they didn’t mind at all. Now, we are moving to the most essential feature of any restaurant. That is, quality of food. 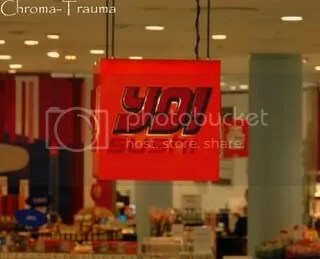 As you noticed from the name; it’s a Sushi Diner, and as result, they cook different types of Sushi. Some of you might want to know how good the Sushi’s were?? Well, I’m not a sushi person. Yes, I did go to a sushi place and I didn’t eat any sushi so I can’t comment on them. On the other hand, my friend tried vegetarian Sushi and she was pleased with it. I think I need to mention, that in a separate occasion, I went with my dear brother to this diner and he didn’t leave without tasting as many Sushi’s as possible (and It did annoy me, mind you) and he didn’t dislike any. He was praising one and indulging in another, so I would assume they were good. So, what did I try? I tried Chicken Salad which was scrumptious, a squid with garden rocket (I loved the texture of the squid.. Fantastic) and then there was the mouth watering Pumpkin Karaoke[I think that was the name of the dish] (Picture of the dish was taken) … which I loved especially with the hot sauce ,, Tasty. Last but not least; A diet Coke… Well, It was hot outside and I did need something cold. My friend tried The Squid and the Pumpkin after I recommended them, she loved the pumpkin but she was not as enthusiastic with the squid, as I was. She tried some kind of Vegetarian Sushi with Avocado that was OK and Miso soup. After 2 hours of chatting, observing, taking pictures and eating, we paid the bill that was very reasonable … Mine was 10 Pounds (5 KD) and my friend was 12 pounds (6 KD) which was not bad considering the place and what we ate. After the huge success of ‘The Princess Diaries’ and it’s less than great sequel, It was expected that this ‘Royal Fantasy’ trend would continue. The following movie would not disappoint you if you are already a fan of the genre, especially for you girls who dream of Prince charming riding on a white horse. I loved ‘The Princess Diaries’, I found its creativity and novelty splendid and these awkward comical scenes completed the magical spell. The movie was good for so many different reasons and one of them is that it didn’t rely on fantasy so that the audience could relate to. The sequel was not as original as it was expected.. They were (The producers) milking a golden cow, but it was acceptable nevertheless. Returning to ‘The Prince and Me’,, The roles changed .. The royal was a prince, a man this time and what is better than linking him with good looking girl and fast forward to the ‘Happily ever After ‘scene. Well, not quite. The Prince ‘Eddie’ leaves Denmark so that he can enjoy the American life where girls are easy to lure without Paparazzi snapping his pictures playing around. He‘s selfish, arrogant and isn’t keen on taking any responsibility in spite of his Father (The King) poor health and his mother monotonous requests. Moving to Paige; The farm girl who is determined to follow her dreams and be a doctor. In other words, she’s a geek whome randomly seen without a book. Introduce Him to her and a fantasy tale would take us through the movie. Unfortunately, It didn’t work for me, It was so annoyingly fake that I kept pausing the movie and watching something else on the TV (Criminal Minds & CSI: Miami). The plot seemed lacking. The actors seemed bored especially Mr Prince who was so corny and very annoying. His companion/servant stole all the scenes that he shared with his fellow actors with his comical portrayal of the faithful servant. I loved his accent, by the way. Julia was good; she did what was expected from her, nothing great but at least she didn’t disappoint. She seemed the only one who enjoyed participating in the movie, I don’t blame her. She’s was in every single scene, treated like a princess, Lived a fairytale and was paid a nice salary for her work, although I don’t think that her role required a lot of work. The soundtrack was good and I enjoyed listening to the tracks. All in all, the movie will appeal to women, young unmarried women particularly, but that doesn’t mean that men won’t like it, but I suspect that. … Recommended for Girls night out.. Worth renting. – Would the Royal Family in Denmark, accept the movie’s portrayal of the prince life style? – Why chose Denmark, if you’re actors speak English accent and quote Shakespeare? – The royal Family should speak in Dutch,, We are using Denmark as a sitting, why English is used to open the parliament sessions ? – Queen: Being royal requires you to sacrifice who you are for who you must be. – Paige: Denmark isn’t ready for a Queen like me.